Georginio Wijnaldum scored four goals as Newcastle trounced Norwich for their first Premier League win of the season to move off the bottom of the table. Wijnaldum struck a composed first, two headers and a superb long-range fourth. Spaniard Ayoze Perez stroked in the third for Newcastle and Aleksandar Mitrovic lashed in the fourth. For Norwich, striker Dieumerci Mbokani had poked in an equaliser to make it 1-1, and Nathan Redmond volleyed for 3-2 before the home side pulled away. An electrifying contest saw five goals scored in the space of 20 first-half minutes, although neither defence covered itself in glory. Mbokani managed to score from inside the six-yard box despite the close attentions of Chancel Mbemba and Fabricio Coloccini, while Wijnaldum was allowed two free headers and Redmond was also unmarked for his brilliant strike. Norwich could have had two more themselves but Robbie Brady and Redmond both hit the post. The priceless result gives Steve McClaren a first league win since taking over at St James' Park and eases the pressure on the former England manager, although Newcastle remain in the bottom three. The Magpies capitulated in the second half against Manchester City last time out, losing 6-1, but recovered by showing brilliant composure in front of goal against Norwich, scoring from all of their six shots on target. Despite the winless start, before the game McClaren insisted his team were making progress, and three points coupled with a stunning attacking display will vindicate that view. Defensively, though, he will still have concerns. The Magpies have now conceded 19 goals in nine games, second only to Norwich (20) and the same as bottom side Sunderland. What went right for Newcastle? McClaren can take positives from the excellent link-up play shown by Moussa Sissoko and Wijnaldum, who combined for two of their goals. Sissoko, in particular, was a threat to Norwich all game and claimed three assists. Netherlands international Wijnaldum was brought in during the summer for £14.5m from PSV Eindhoven, becoming the club's third most expensive signing after Michael Owen and Alan Shearer. Although he hasn't produced his best so far this season, Wijnaldum showed his class in this match with a rare quadruple, becoming only the second player - after Shearer - to score that many in a single Premier League game for the club. They included a cool first goal and two well-directed headers, but his fourth was the pick of the lot. He collected the ball around 40 yards out before gliding forward and arrowing an effort past John Ruddy, albeit via a deflection. With Wijnaldum in this form, £13m summer signing Mitrovic also among the goals and Sissoko to the fore, Newcastle have realistic hopes of climbing away from danger, although they will need to tighten up at the back. BBC Sport's Chris Bevan at St James' Park: "It has been many months since the stadium was last in full voice but the atmosphere here was at its deafening best at the end of this afternoon. "By the 70th minute, with the Magpies 5-2 up and chants of 'we love Newcastle, we do' echoing around the ground, you could be forgiven for thinking the good times were back, rather than watching a team that was bottom of the table, about to record their first league win of the season and were hammered 6-1 last time out. "The mood had been a lot tenser than that until Newcastle's fourth and fifth goals went in but, bearing in mind their poor home form leading up to this game, their fans had remained patient and also pretty positive. "They stayed behind their players and manager Steve McClaren throughout, and the final whistle was greeted by a huge roar. For the first time this season, they will have left the ground wearing broad smiles on their faces." Norwich manager Alex Neil has big problems after seeing his side fail to win in their last four league games, dropping them to 16th in the table. Having conceded six goals against Newcastle, they now have the worst defensive record in the division and have not kept a clean sheet in any of their nine league games. The ease with which Newcastle scored some of their goals will be the biggest worry, with the men in black and white afforded time and space to pick their spot. Newcastle head coach Steve McClaren: "I am relieved for the supporters and players who have endured a lot. "We knew a win was around the corner, but we didn't know when it would come. We played some really good football. We kept the faith with the players - everyone around us is saying what they've been saying, but we've got to keep tight." Norwich manager Alex Neil: "There was one decision made in the game, when I took Alex Tettey off, that didn't have the effect it should have had. "It made us more vulnerable at the back. When you concede that many goals it's hard to take positives, but offensively we looked a threat." Newcastle striker Aleksandar Mitrovic: "I enjoyed the goal a lot. We played the perfect game. After a few bad games we showed how to play football. Wijnaldum showed a bit of magic today." Moussa Sissoko became only the second Newcastle player to register three assists in a Premier League match, after Andy Cole against West Ham in March 1994. This was the highest scoring Premier League match so far this season. Derby day for Newcastle next Sunday (kick-off 12:00 BST) as they face Sunderland, while Norwich are at home to West Brom on Saturday. 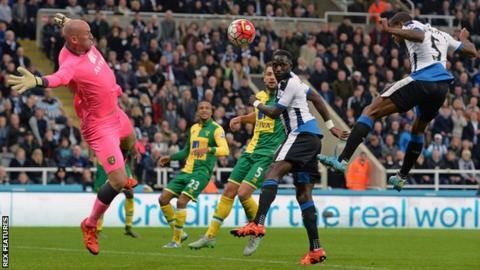 Match ends, Newcastle United 6, Norwich City 2. Second Half ends, Newcastle United 6, Norwich City 2. Attempt missed. Cameron Jerome (Norwich City) left footed shot from outside the box misses to the right. Assisted by Gary O'Neil. Jack Colback (Newcastle United) wins a free kick on the right wing. Attempt blocked. Dieumerci Mbokani (Norwich City) right footed shot from outside the box is blocked. Assisted by Nathan Redmond. Substitution, Newcastle United. Papiss Demba Cissé replaces Aleksandar Mitrovic. Goal! Newcastle United 6, Norwich City 2. Georginio Wijnaldum (Newcastle United) right footed shot from outside the box to the top right corner. Assisted by Ayoze Pérez. Cameron Jerome (Norwich City) wins a free kick on the right wing. Substitution, Norwich City. Cameron Jerome replaces Martin Olsson. Substitution, Norwich City. Gary O'Neil replaces Graham Dorrans. Corner, Newcastle United. Conceded by Sebastien Bassong. Offside, Newcastle United. Massadio Haidara tries a through ball, but Aleksandar Mitrovic is caught offside. Corner, Norwich City. Conceded by Fabricio Coloccini. Attempt saved. Jonny Howson (Norwich City) right footed shot from outside the box is saved in the centre of the goal. Assisted by Robbie Brady. Attempt saved. Robbie Brady (Norwich City) right footed shot from outside the box is saved in the bottom left corner. Assisted by Graham Dorrans. Attempt missed. Steven Whittaker (Norwich City) left footed shot from outside the box misses to the right. Assisted by Wes Hoolahan following a corner. Corner, Norwich City. Conceded by Georginio Wijnaldum. Attempt blocked. Jonny Howson (Norwich City) right footed shot from the centre of the box is blocked. Attempt blocked. Russell Martin (Norwich City) header from the centre of the box is blocked. Assisted by Nathan Redmond with a cross. Corner, Norwich City. Conceded by Robert Elliot. Attempt saved. Dieumerci Mbokani (Norwich City) header from the centre of the box is saved in the centre of the goal. Nathan Redmond (Norwich City) hits the left post with a right footed shot from the right side of the box. Assisted by Wes Hoolahan.